Digging wells, giving out seeds and fertilizer and providing safe pasture for herders are among the inducements offered by Islamic State in West Africa (ISWA), which split from Nigeria’s Boko Haram in 2016. The campaign, which has created an economy for ISWA to tax, is part of the armed insurgent group’s push to control territory in northeastern Nigeria and in Niger. ISWA stretches farther and is more entrenched than officials have acknowledged, according to witnesses, people familiar with the insurgency, researchers and Western diplomats who have for the first time provided details of the group’s growing efforts to establish a form of administration in the Lake Chad area. A map produced by the U.S. development agency in February and seen by Reuters shows ISWA territory extending more than 100 miles into the northeastern Nigerian states of Borno and Yobe, where government has in many areas all but vanished after a decade of conflict. The Islamists have not been defeated, as Nigeria says, and researchers say ISWA, less extreme than Boko Haram, has evolved into the dominant group. The U.S. map paints a similar picture, with ISWA operating in much of Borno. “Islamic State has a terrible reputation for being so brutal around the world, and people can’t imagine an Islamic State faction could be more moderate (than Boko Haram),” said Jacob Zenn, of The Jamestown Foundation in Washington, D.C. FILE - A fisherman rows a canoe on Lake Chad, in Koudouboul, Chad, Nov. 25, 2006. The Lake Chad countries — Nigeria, Niger, Chad and Cameroon — have long neglected the region, allowing ISWA to create a stronghold from which to launch attacks. Its gains contrast with setbacks for Islamic State in Syria and Iraq. It makes sense for ISWA to organize the local economy and raise taxes, said Vincent Foucher, who studies Boko Haram at the French National Centre for Science Research. “It opens the longer game of trying to create a connection to people,” he said, adding that if ISWA succeeds it may become a greater threat than Boko Haram. In 2015, Nigeria’s President Muhammadu Buhari pledged to finish off Boko Haram. Officials maintain this has been achieved, although the conflict continues into its 10th year. A presidency spokesman declined to comment for this story. 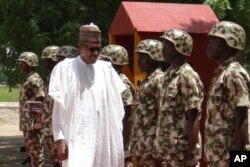 FILE - Nigerian President Muhammadu Buhari reviews troops in Maiduguri on Oct. 1, 2017. Analysts estimate that ISWA has 3,000-5,000 fighters, about double Boko Haram’s strength. But ISWA’s territory is not completely secure. The Nigerian air force often bombs, and troops from Lake Chad countries attack the insurgents’ domain around its shores and islands. “They are not a government, they kidnap girls from schools,” Agim told Reuters in a separate interview. The military has announced an operation “to totally destroy Boko Haram locations in the Lake Chad Basin” — ISWA’s domain — and end the insurgency within four months. But ISWA has so far proved intractable in its Lake Chad bases, where troops have been unable to make effective inroads, according to a Western diplomat who follows the group. The Nigerian military had “completely lost the initiative against the insurgency,” they said. 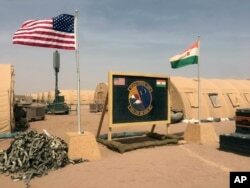 FILE - A U.S. and Niger flag are raised side by side at the base camp for air forces and other personnel supporting the construction of Niger Air Base 201 in Agadez, Niger, April 16, 2018. The U.S., British and French militaries are helping regional governments with intelligence and training. Western officials declined, or did not respond to, requests for comment. ISWA protects locals from Boko Haram, something Nigeria’s army cannot always do. That, according to one of the people with knowledge of the insurgency, has won the group local backing and eroded support for the military. ISWA is led by Abu Musab al-Barnawi, the son of Boko Haram’s founder, Muhammed Yusuf, whose killing by police in 2009 sparked an Islamist insurgency in Nigeria that, according to the Armed Conflict Location & Event Data Project, has so far cost more than 34,000 lives. ISWA’s leaders keep a low profile, not appearing in videos or claiming responsibility for attacks, possibly to avoid the international media, and the ire of regional governments. Reuters was unable to contact the group for comment. This contrasts with the wholesale violence of Boko Haram under the publicity-hungry Abubakar Shekau, who has executed even close lieutenants. His group has strapped suicide bombs to women and children to attack civilians in mosques, markets and refugee camps. Boko Haram and ISWA are bloody rivals, but some travelers in ISWA territory feel safer than elsewhere in Nigeria’s northeast. “They have checkpoints for stop and search, and if you are a regular visitor they know you,” said a second herder, adding that ISWA has spies everywhere, including informers who alert them to military attacks. He described seeing Islamic State’s black flags and said preachers were used to win people over. Under ISWA, men must wear long beards, nighttime movements are restricted, and prayers are compulsory, the herder said. Offenders can get 40 lashes. The herders said ISWA provides safe grazing for about 2,500 naira ($8) a cow and 1,500 naira ($5) for smaller animals. ISWA also runs slaughterhouses for the cattle, taking a cut for each animal, as well as from other activities like gathering firewood. Maiduguri is the biggest city in Nigeria’s northeast, the center of the military’s fight against Boko Haram. But rural areas largely remain no-go zones for the authorities. It is there that ISWA is making its mark, offering people protection, particularly from Boko Haram. “Al-Barnawi is sending people into IDP (displaced persons) camps to encourage people to return and farm, and the people are,” said a person with knowledge of ISWA’s activities. The person said Nigeria’s military plays into the insurgents’ hands by shutting down markets to deny supplies to the group, while ISWA encourages business. “They are friendly and nice to those who come to the area, while they indoctrinate other people and sometimes they bring motorcycles for those who want to join them,” a charcoal maker said. Despite its name, experts believe ISWA’s ties to Islamic State in the Middle East are limited. “What’s clear from ISWA primary source documents is that ISWA has asked IS for theological guidance on who it is lawful to attack,” said Zenn. Daily activities, including military operations, are left to its leaders, he said. Others say the insurgency lacks the broader appeal of Islamic State in Iraq and Syria. “ISWA is the largest IS affiliate, but it’s very much a Nigerian organization. It doesn’t have foreign fighters coming, it’s hard to get to this place,” said the Western diplomat. What fighters it does have can carry out targeted attacks, including the February kidnapping of 100 schoolgirls from the town of Dapchi, most later released without explanation, and a deadly raid on a Nigerian military base in March. But ISWA faces a dilemma: while wooing the population, it has harshly punished those who resist it, for example massacring dozens of fishermen last August, and this could hurt its standing with local people. “It’s important not to paint too rosy a picture,” said Foucher, the researcher.